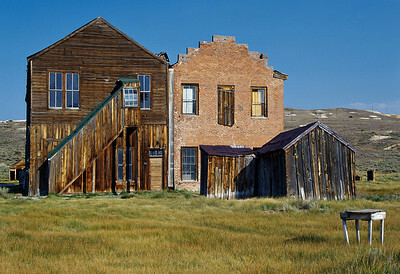 Now a State Park, Bodie was a flourishing gold mining city of 8,000 people and 2,000 buildings in 1879. In 1881 a peak of $3.1 million of gold ore was produced. 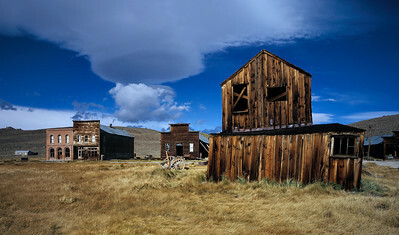 The prosperity declined and by the 1920s, Bodie's population dwindled to 120 people and the gold rush became history. 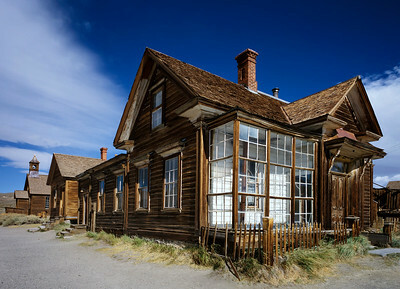 This is a view of Main Street Bodie from the east. In the right foreground is the Wheaton & Hollis Hotel and Hydro Building. In the background along Main St, left to right, is Dechambeau Hotel, I.O.O.F. 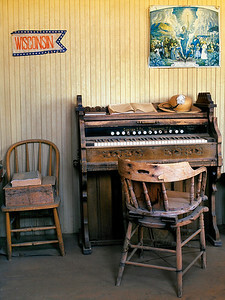 Hall, and the Miners Union Hall which now serves as a Museum and Visitor Center. 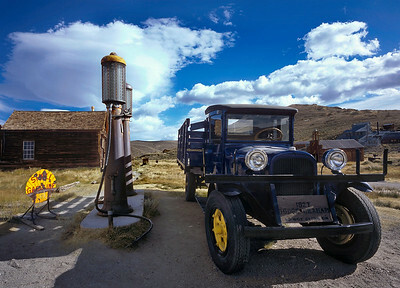 A 1927 Dodge Graham parked at the now defunct Shell gasoline pump. From the looks of the sign, Bonnie and Clyde must have stopped here. Note there is snow on the ground. 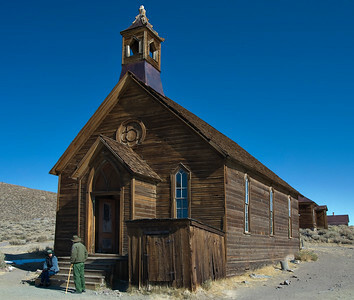 Not surprising since Bodie is at an elevation of 8,375 feet. 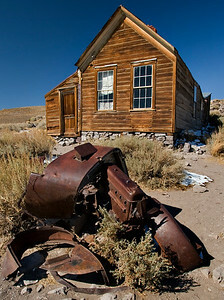 This is a typical Bodie residence with a slightly used car in the foreground. On the steps of the Methodist Church, Linda is discussing with a park ranger whether it would be useful to go in and pray for better cloud formations to enhance Doug's photography results. 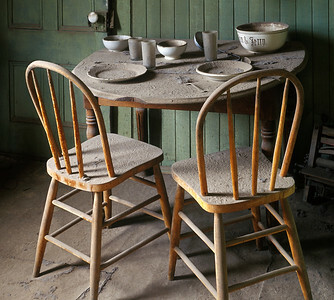 This might be street cafe dining Bodie Style; you would have to bring your own chair. The buildings are the I.O.O.F. Hall (left) and the Dechambeau Hotel, located on Main St and viewed from the rear. 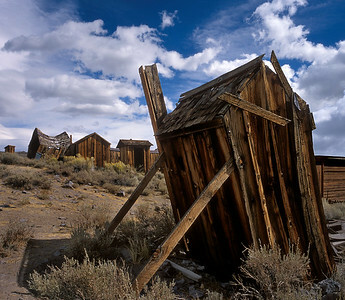 Some of the more weathered structures of Bodie. 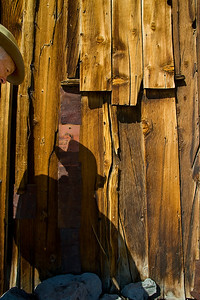 In the foreground is a leaning outhouse that would be a precarious adventure at best. 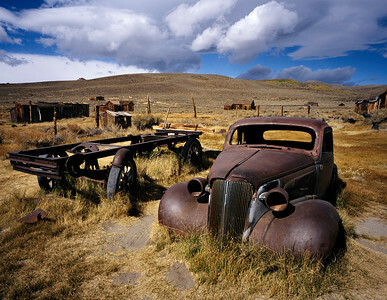 Behind the Visitors Center is an outdoor museum of various farm equipment and this rusting 1937 Chevrolet coupe. On the distant hill, high and to the left, are located the five Bodie Cemeteries: the Wards, the Masonic, the Miners Union, the Chinese, and finally a cemetery for "outcasts." 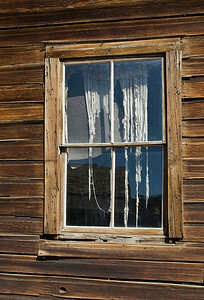 A weathered window with equally weathered drapery. Front window view into the Boone Store on Main St. 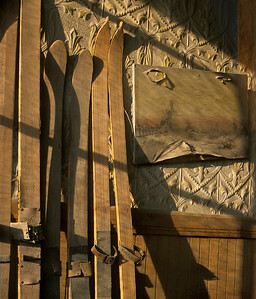 This photo gives a hint as to how locals got around in winter months. The painting on the wall has seen better days. 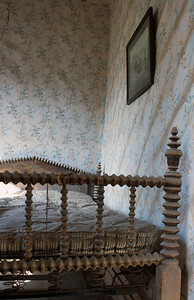 The Miller House and a few others are open to give the public an idea of what life was like in Bodie during its heyday. Mostly you have to look through widows to get a sense of life around the turn of the 19th century. Houses are necessarily small and quarters would be considered cramped by today's standard. 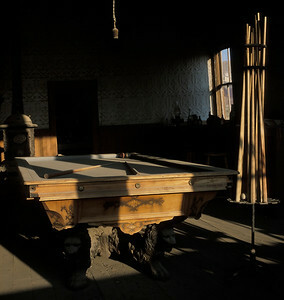 Pool hall located in the Wheaton and Hollis Hotel. The schoolhouse was located on Green St. Visible today are many student desks and this organ. It must have been a tough assignment for a teacher! 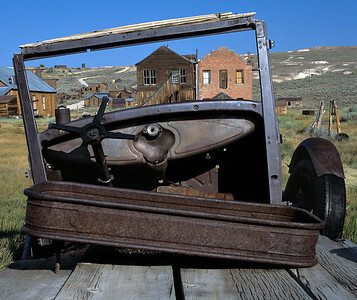 Viewing Bodie from the outdoor museum and looking to the east. This looks to be a sun porch located in the J.S. Cain Residence. Walking to the left down Green St you pass the Miller House on the way to the Methodist Church. 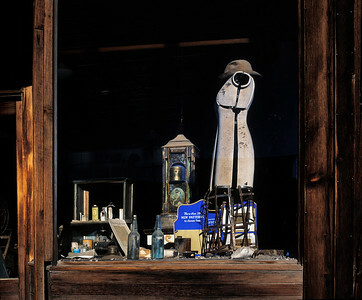 Doug thinks he has spotted the fleeting figure of a Bodie ghost.